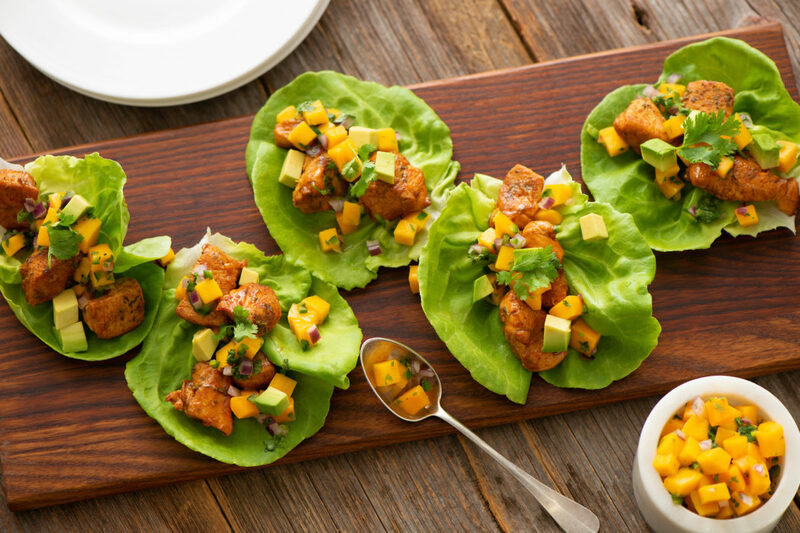 These versatile Tex-Mex chicken salad cups are topped with a fresh mango salsa. They can be served as an appetizer, or for lunch or a light dinner. Stir together mango, red pepper, red onion, jalapeño, lime juice, cilantro, honey and salt. Let stand for 10 minutes. Meanwhile, toss chicken with chipotle powder. Heat oil in large skillet set over medium heat; cook chicken, thyme and garlic for 3 to 5 minutes or until chicken is browned. Stir in 1/2 cup water, lime juice, chicken base and honey; bring to boil. Reduce heat to medium-low; cook for 6 to 8 minutes or until liquid is reduced and chicken is glazed. Divide chicken mixture among lettuce leaves. Top with mango salsa, avocado, tortilla strips and cilantro. Tip: Alternatively, serve in tortillas as tacos or roll up as burritos.